Jessica Lynch on Cover of Newsweek. Nightvision view of Jessica's rescue. Army says errors, speed led to disaster for Lynch's unit. Jessica Lynch didn't empty her weapon before being captured in Iraq, as was at first reported, an Army report says. Crash caused Lynch's 'horrific injuries,' not Iraqi militia. The Army will release a report tomorrow on the ambush of the 507th Maintenance Company in Iraq that will show Pfc. Jessica Lynch and another female soldier suffered extensive injuries in a vehicle accident, but not from Iraqi fighters. The Army's 15-page report officially will debunk accounts that Pfc. Lynch emptied two revolvers at her attackers and was shot and stabbed before being taken prisoner of war. Lynch family says Jessica has never had amnesia. The Lynches declined to answer questions about an Army investigation of the ambush, "We’re not supposed to talk about it," Greg Lynch said. "It’s still an ongoing investigation." Daily Journal Claim: Pentagon covering up Jessica story. Jessica has been locked up in a private Walter Reed hospital room with an around-the-clock security detail normally reserved for high brass to ensure that what happened to her as a prisoner of war remains inside her room. Aloha Jessica! Jessi going to Hawaii. Former POW Accepts Invitation For Free Maui Vacation. The Ballad Of Jessica Lynch: Former POW's Hometown Friends Talk. Even before her rescue in Iraq, former POW Jessica Lynch was a hero to many of her friends in Palestine, West Virginia. Does Pfc. Jessica Lynch Own the Movie Rights to Her Life? NBC is planning to make a movie about Pfc. Jessica Lynch, the rescued American POW, even if it doesn't get her permission. Can the network do that? Doesn't NBC need to buy the movie rights to her life? Rescued POW Lynch arrives in U.S.
"Our family has been blessed by the tremendous outpouring of support for our daughter, Jessi. People from across West Virginia, the United States - everywhere in the world - have offered comfort and aid. On behalf of Jessi, our family would like to offer our deepest, most sincere thanks for this show of affection." "We would especially like to thank the U.S. Army, the U.S. Air Force, the West Virginia National Guard, and U.S. Senator Jay Rockefeller for their help in uniting us with our daughter. We would also like to thank the residents of Wirt County and West Virginia Governor Bob Wise for their commitment to helping Jessi experience a full and speedy recovery." "Furthermore, we can't leave Germany without expressing our gratitude to the professionals at Landstuhl Regional Medical Center and the Air Force Aeromedical Evacuation Squadron. We truly believe Jessi would not have made such great progress in her recovery had it not been for their care and concern. We are forever thankful for the compassion with which they have treated her and the other injured service members." Jessica’s Liberation. Moving stealthily through the night, Special Forces execute a bold raid to save a private. The mission—and her story of survival. Jessica Lynch leaves behind her best friend. 'It's such a mixed emotion.' During their tour at Fort Bliss, a sprawling military base on the western tip of Texas, Jessica Lynch and Lori Ann Piestewa had little choice but to spend time together. "You never saw one without seeing the other," Sergeant Shirley Atma said yesterday. "They were very outgoing and happy people." After Pfc. Jessica Lynch was rescued from an Iraqi hospital, the Pentagon provided a somber epilogue early Saturday by announcing the identities of eight of nine dead American soldiers also recovered during the operation. 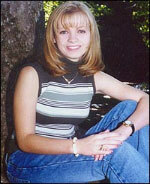 BETTER TIMES... Jessica Lynch, a pretty 19-year-old country girl posing at her home in West Virginia. Private Jessica Lynch — known as 'Jessie' — only joined up because she could not find a job in her farming community home town of Palestine, West Virginia. The Lynch family, shortly before taking off for Germany, say they realize how fortunate they are. The private jet of Gov. Bob Wise of West Virginia is in background. - It was their first ride in an airplane. To help Lynch reach her goal of becoming a kindergarten teacher, West Virginia and Marshall universities and Liberty College in Lynchburg, Va., offered her competing packages Wednesday. And West Virginia Gov. Bob Wise said the state would finance Lynch's education at a state public college or university of her choosing. United Justice is copyright © 1998-2003 by Radok Corporation. Contents and design protected by Source Watch.